older children, teens or adults. Some experience with Square knots is required. I used Satin Cord in the example shown. It is a great choice for most jewelry designs, but it's delicate. Make sure you do not pass pins through it. Use the Cross-pin Technique or apply tape to secure the cords. This necklace pattern does not require a clasp, so it needs to be large enough to fit over the head. That's usually 20 - 28 inches, depending on the size of the person wearing it. Use a piece of scrap cord to make a circle, placing it over your head until it's the right size. Then measure it, and make the necklace to that size. Preparation: Cut two cords of each color, 2.5 times the length you need. So for a 24-inch necklace, you cut the cords to at least 60 inches. Step 1: Locate the center of all four cords and secure them to the board. Place a piece of tape to mark the center. You will work from the center towards the ends. Arrange the cords as: 1 Color A --2 Color B -- 1 Color A. In the images color A = purple, and color B = blue. Mentally number the four cords from left to right. Slide cords 1 and 4 (color A) through the first bead, and slide it up close to the tape. It needs to rest between cords 2 and 3. 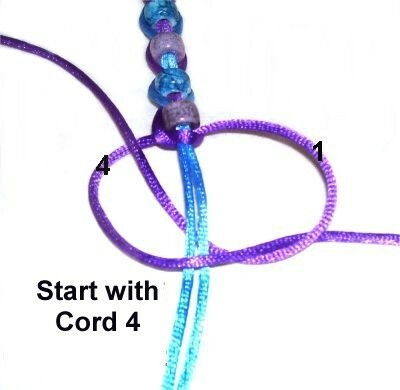 Step 2: Bring cords 2 and 3 (color B) over the other two, and slide them through the next bead. Slide it up as far as you can while holding the cords flat on your board. 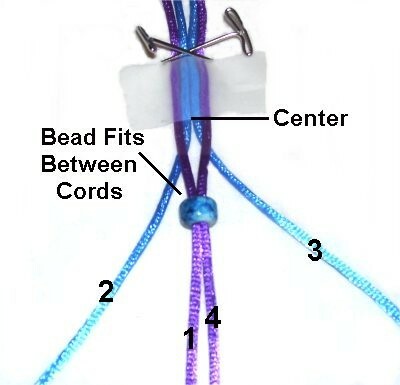 Make sure the bead rests between cords 1 and 4. This image shows a closer view of the beading process. Make sure the cords fit snugly around the beads, not below them. 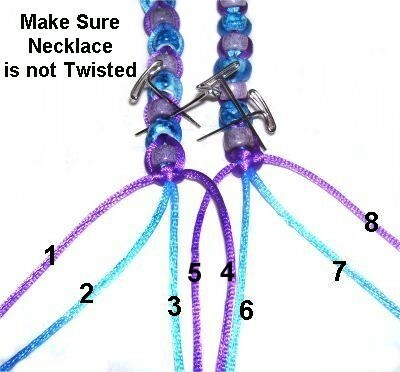 If they slide under the beads easily, the cords are too tight. 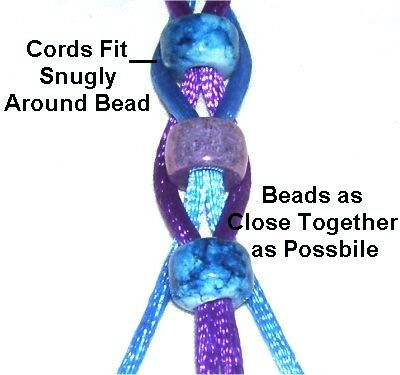 Usually all you need to do is push the beads close together and the cords will have the proper tension. Step 3: Repeat steps 1 and 2 several times, until the Beaded Necklace is half the size you need. So for a 24-inch necklace, stop at 12 inches. Important: Before you move on to the next step, go back to the center. Move each bead as close together as possible, removing the slack as you progress. Then measure the Beaded Necklace to see if you need a few more beads. You will now tie a right Square knot. This image shows the first step. Mentally number the cords 1 - 4. Move cord 4 to the left, passing over 2 and 3 (fillers). Pass it under cord 1, which is the left working cord. 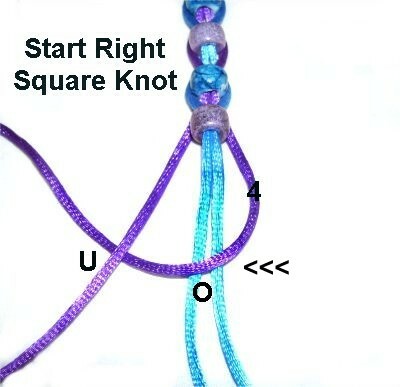 Design Tip: Any time you tie Square Knots, the head will face the direction of the cord you start with. So in this case, the cord on the right was first, so the knot faces right. Step 4: To complete the first half of the Square knot, bring cord 1 under the fillers (2 & 3), and over cord 4, as you move it to the right. Pull on the ends firmly. Step 5: The second half of the Square knot is tied in the opposite direction, since the two working cords have switched places. Pass cord 4 over the fillers, and under cord 1, heading right. To complete the knot, bring cord 1 under the fillers, and over cord 4, as you move it left. Step 6: Turn the Beaded Necklace around, and go back to the center. Flip the necklace upside down, so the beading pattern doesn't change. 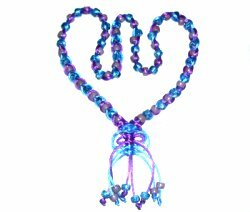 Important: Before you move on, go back to the Square knot tied at the other end of the Beaded Necklace. 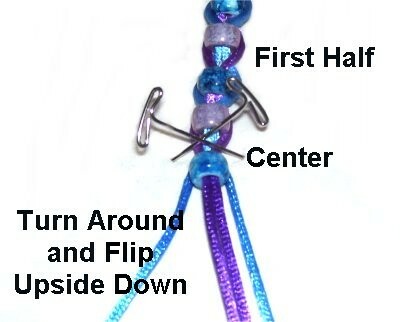 Push the beads close together again, removing any slack. Then measure to see if you need more beads. When you are through, turn the Beaded Necklace with the front face up on both ends. 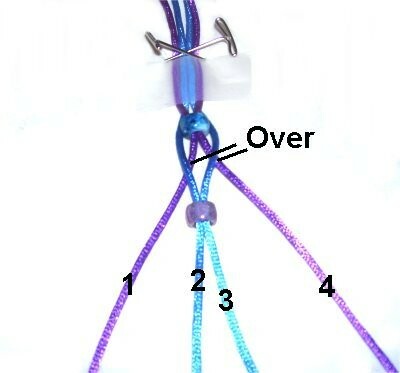 Step 7: Repeat steps 4 - 6, tying another Square Knot. You can make it in the opposite direction if you wish (start with left cord). 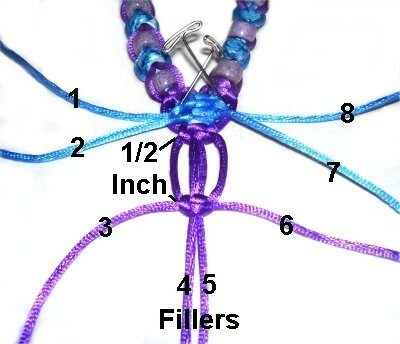 The picot design on the front of the Beaded Necklace is optional, if you prefer something else. You could just create a clasp and wear it so that area is at the back of the neck instead of the front. Adding a pendant is another option. Step 1: Position the necklace so all the ends are in front of you. Make sure the necklace is not twisted, and lies flat on your board. Secure it with tape or pins. Mentally number the ends 1 - 8. The fillers for all these knots are cords 4 and 5. Tie a Square Knot with cords 3 and 6, around the fillers. Important: Apply glue after you tie the first half of the knot. Then tie the second half. Step 2: Move cords 3 and 6 to the sides. Pass cords 2 and 7 under them, and tie the second SK, around the fillers (4 - 5). Step 3: Tie the third SK with cords 1 and 8, after moving them under the 2 working cords previously used (on each side). 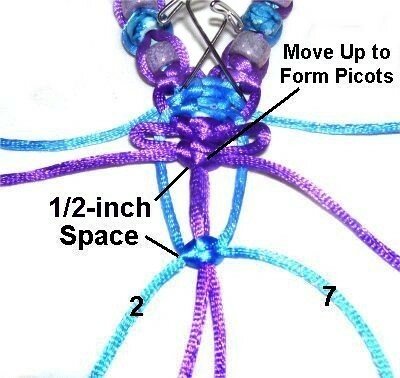 In the next three steps you will make the picot designs for the front of your Beaded Necklace. Step 4: Mentally label the cords again 1 - 8. The fillers are still cords 4 and 5 for all three knots. 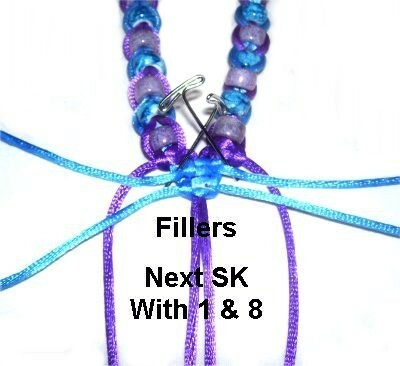 Tie the next SK with cords 3 and 6. Tighten it so it rests 1/2-inch below the SK tied in the last step. Apply glue between the first and second half of the knot. 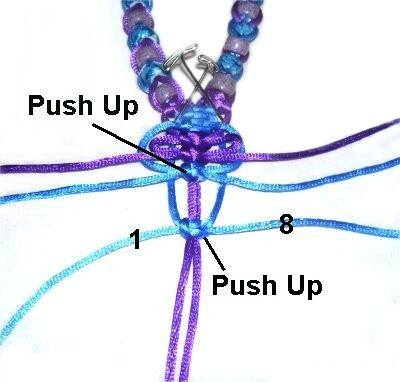 Step 5: Push up the knot you just tied, so it rests against the one tied in step 3. This forms the first picot loops. Bring cords 2 and 7 under those used in step 4. Tie a SK, making sure it rests 1/2-inch below the previous one. Apply glue between the first and second half of the SK. Step 6: Push up the second SK, so it rests next to first knot (from step 4). Leave a 1/2-inch space, and tie the third SK using cords 1 and 8. Make sure you bring the ends under the other working cords previously used. Allow the glue to dry for at least 1 hour before moving on to the final step of the Beaded Necklace. << Apply one bead to an end. 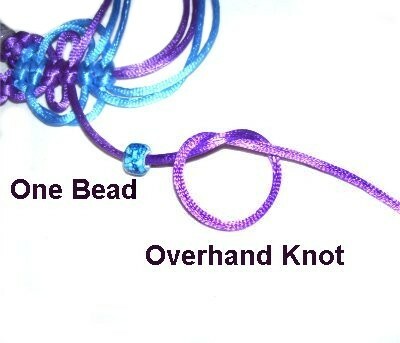 Start the Barrel knot by tying an Overhand knot. 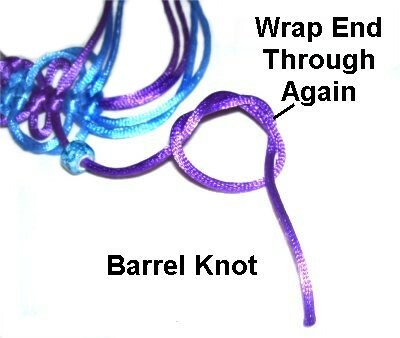 Wrap the end around the loop >> again to complete the Barrel knot. As you tighten, apply glue. Repeat the process for the remaining ends. The knots don't need to rest at the same level unless you want them to be even. After the glue is dry, cut off the extra material. Have any comments about the Beaded Necklace? Contact Me.